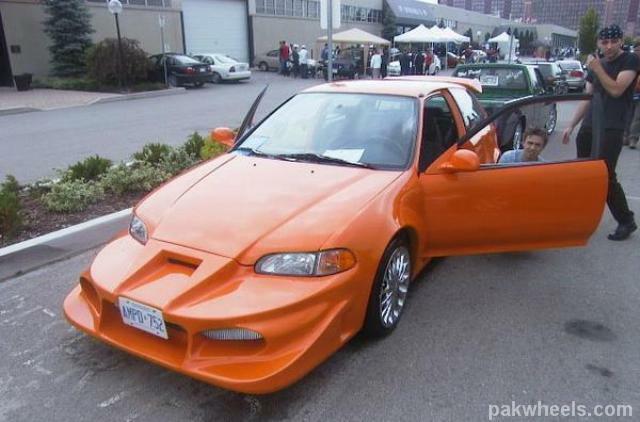 1) Body modifications - Whether it's a new spoiler, a body kit, or hood scoop, changing the look of the car's body is the most obvious and dramatic modification you can make, and will undoubtedly make your car worth less. First of all, unless you're one of the few who chooses tasteful body modifications, there will be very few people lining up to buy your silly looking car. Secondly, most of these additions are haphazardly painted and since they are not original vehicle parts, don't fit quite right, with mismatched seams and uneven placement. If you're going to make body modifications to your car, you should plan on keeping it...forever. 2) Performance-enhancing modifications - There are several reasons why adding modifications that speed up your car will affect resale value, even though they may not be noticeable to the naked eye. The first is that anyone who makes these modifications is very likely to have pushed the car beyond basic commuting and transportation, and possibly even taken it to racetracks. This opens the possibility that the car has been "beat on," and not babied. Even if you have taken impeccable care of the car, and just wanted it to have a little more power, the perception is there, likely narrowing your potential field of buyers, and therefore lowering the value. Finally, performance modifications can actually affect your insurance premiums, adding to the general cost of ownership and making it a less attractive purchase. 3) Changing out lights - It may sound trivial, but changing out a car's lights or adding lighting can have a detrimental effect on vehicle value. Similar to body work, not everyone will appreciate your choice when it comes to light designs. Low-quality lights will not only make your vehicle look terrible and turn off potential buyers, but they could even leak, allowing water to seep into your car's chassis. Furthermore it should be noted that very few cars actually look good when someone has changed out the stock lights. You should trust the vehicle designer's taste on this one. 4) Loud exhausts - In addition to annoying everyone everywhere you go, a loud exhaust or muffler is sure to decrease the value of your car. To put it quite simply, no one wants to be the center of attention, except for you. The thought of driving around in a car that everyone can hear coming from a mile away only appeals to a certain type person, and unless you're planning on finding that person when it comes time to sell your car, the loud exhaust is a bad idea. Another thing to keep in mind is that some states will regulate exhaust noise and emissions, so your car may not even be able to pass inspection when the new owner has to register it. 5) Aftermarket rims/tires - Again, this is a matter of imposing your personal taste on everyone else, but changing out the wheels on your car could make it harder to sell down the line. There are, of course, exceptions. If you keep the original wheels and tires, it's not difficult to swap them out before you sell or if the potential buyer prefers the originals. But oftentimes, by putting aftermarket wheels on your car, you're turning it into the exact car that YOU want, not necessarily the car someone else wants. So if you're going to change out the wheels, make sure you hold onto the original ones.